Jamie Carragher’s generosity has been outlined by a hefty donation to stricken Liverpool supporter Sean Cox, following a successful fundraising night in the city. 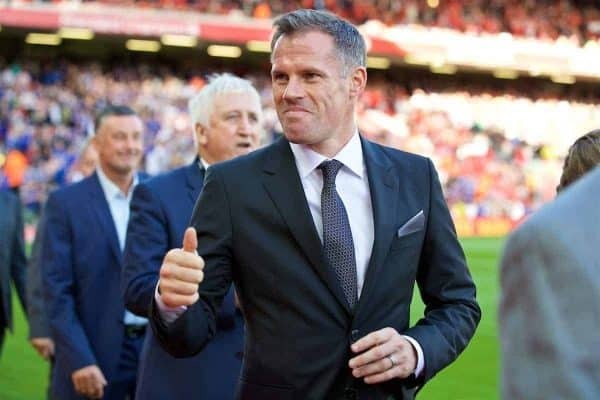 The Reds were busy beating Bournemouth 3-0 last Saturday, but later that evening an event took place in Liverpool organised by Carragher’s charity, The 23 Foundation, and BOSS Night. Hosted at Hinterlands in the Baltic Triangle, Carragher was interviewed by renowned sports journalist Brian Reade, with relatives of Cox’s among those present. Musician Jamie Webster also performed, with the proceeds going to the Sean Cox Rehabilitation Trust, as the Irishman continues to recover from life-saving injuries. “If you’re having a night out, you’ve got to do it properly! I don’t mind getting up singing, I’ve been doing it for years. “Simon Cowell has been on and Tom Jones has spun round in his chair! But it was good fun. “It was a great night, but the important thing is we are doing all we can to help Sean Cox and his family. “What happened before the Roma game, it could have happened to absolutely anyone. It happened in tragic circumstances. £11,067 was raised in total and Carragher has made a personal donation of the same amount. It is a fantastic gesture by the 41-year-old, who spent the evening on good form, singing along to ‘Allez Allez Allez’ on stage. The total amount raised for Sean Cox from the event this weekend was £11,067. @Carra23 has generously said he’ll personally match this amount ? The former Liverpool centre-back – the club’s second-highest appearance maker – is also hoping to take part in a fundraising match in aid of Cox in Dublin in April 12. A host of Liverpool and Republic of Ireland legends will appear at the Aviva Stadium, including Robbie Fowler, Ian Rush, Robbie Keane and John Aldridge. Cox was left in a coma after being attacked by a Roma supporter prior to last season’s Champions League semi-final first leg clash at Anfield. His wife, Martina, spoke at the launch of the Dublin match on Monday, saying her husband is making “encouraging progress” and can now “do things now that he wouldn’t have been able to do a couple of months ago”.